Supply Only - we supply you install. Supply & Fix - by Duration Windows. Onsite Instruction - by Duration Windows. Full Installation - by a Duration trade customer. ...each of these options is explained below. We are a supply only manufacturer, we do not provide a full installation service for any of our products. If your require a full installation service, contact us and we can provide you with fitting companies in your area. The majority of our customers are trade customers who require nothing more than for us to manufacture and supply them with our quality products. If you require 'supply only' we will supply you with bi-folding doors that have been manufactured to your exact specifications and have been fully tested at our factory. We will guarantee the doors, but you will take full responsibility for providing the correct manufacturing sizes. You can have your doors delivered, or collect from our factory. You would then install the doors yourselves. Please be aware that when we say manufacturing sizes we mean the overall sizes you want us to make the doors, and not the sizes of the hole you are installing them into. You will need to allow for fitting tolerances and also take the threshold, projection cill, floor levels and head extension for trickle vents into consideration. For help and advice with installation please visit our fitting help page or contact us today. Coverage (Zones A & B): Bedfordshire, Berkshire, Buckinghamshire, Cambridgeshire, Essex, Gloucestershire, Hampshire, Hertfordshire, Kent, Leicestershire, London, Norfolk, Northamptonshire, Oxfordshire, Rutland, Suffolk, Surrey, Sussex, Warwickshire, Wiltshire, Worcestershire. Installing bi-folding doors requires specialised care and attention. If you are a trade company or individual that doesn't want the hassle of installing bi-folding doors, then why not get us to supply, deliver and 'fix' your bi-fold doors into an existing and fully prepared aperture. When 'fixing' our doors we will install the doors with due care and attention, toe and heel the panels, foam the frame (where necessary), fully test the doors, and leave the doors in a perfect working condition. Our fixing service is available within areas A + B on the map (See map). Please note that our 'fixing' service is only available for our bi-folding doors and is by no means a full installation service. This service does not include (but not limited to) mastic, sealing outside, plastering, rendering, making water tight, removing existing doors or preparing the hole. We will come out to site and survey the prepared aperture, take responsibility for the manufacturing sizes and the fixing of the doors within the hole. We will guarantee our workmanship and the doors. We will then 'fix' your bi-fold doors as detailed above (see fixing only service). Please make sure all involved parties; builders, homeowner and other trades are aware of what work is and is not done by Duration Windows. Please contact our Sales Department for more information and advice. If you are the end user and require a full installation service with a company that can take your project from concept to completion, we can help. We will provide you with the details of several of our experienced Trade customers, within your local area. You will deal directly with them and they will supply and fit your doors and look after the whole project from concept to completion. 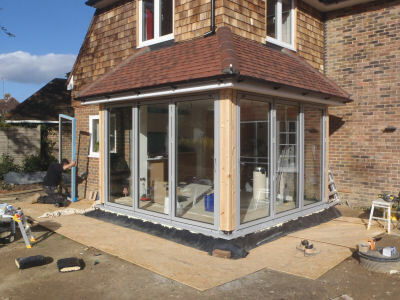 They will handle all aspects of the installation including the survey, fitting, sealing and guarantees. They also usually take care of any building work, plastering and rendering etc. In the unlikely event of any problems you would deal directly with them. Once we consider you to be an experienced installer of our bi-folds we can refer customers in your area to you. We receive a countless number of leads each year. Homeowners phoning us, asking us to supply & fit our products. As a manufacturer we will pass these leads onto you. If you would like to be considered as a recommended installer or would like more information on how this works then please contact us for more information. We can also provide you with samples for your showroom. If you lack room to get a bi-fold in your own showroom, or do not have a showroom, then you can bring customers to see them at our exhibition centre on Canvey Island. You can show them around yourself or ask us to do it on your behalf, but please let us know to expect one of your customers.